There are many ways to visit Auschwitz. Just about every hotel in Krakow offers a tour to Auschwitz which includes transportation and around four hours at the historic site known for the atrocities committed by Nazis during World War II. A hotel tour is the easiest way to see Auschwitz. Having said that, four hours is hardly enough time to see Auschwitz I and Auschwitz II-Birkenau, the two camps that most people visit. I signed up for a six-hour study tour in English through the Auschwitz website for 80 zloty ($21). I was concerned six hours might be too long for my attention span. The camps, however, are enormous, and six hours was just the right amount of time for visiting. Auschwitz offers the English-speaking tour daily at 9am. It sells out in advance, so be sure to book a week early, at least in the winter, and perhaps earlier in the summer. In addition, be aware that visitors must arrive 30 minutes prior to their tour to go through security and to check-in. In the less crowded months, 15 minutes should suffice. This arrival time requires finding public transportation beginning no later than 7am, maybe earlier. It is also possible to visit Auschwitz without a tour, but an educator is worth the money. I arrived in Krakow late the night before my tour. Wandering around the bus station early in the morning on little rest and negotiating how to purchase a bus ticket in Polish didn’t suit me. As such, I opted for an expensive Uber ride. Taxify, Eastern Europe’s version of Uber, might have been a better option, but regardless, a 1.5-hour ride isn’t cheap. I justified it by taking the bus back to Krakow. The bus literally stops in the Auschwitz parking lot, and I was able to purchase a ticket from the bus driver which simplified matters. Sometimes the buses are full, however, so I was probably lucky to be visiting in the wintertime. My Uber driver challenged my patience. He accepted the ride prior to dropping off other passengers, so it took almost 20 minutes for him to pick me up. Then he needed gas. Luckily I had added extra time for the snowy weather, and I arrived at the parking area of Auschwitz with ten minutes to rush through security and to reach check-in. Fortunately, I made it and joined a group of about 15 visitors and an educator with a few minutes to spare. Our educator was extremely knowledgeable and rattled off lots of history in decent English. We started our tour outside of Auschwitz I, the first camp constructed, which included the administrative headquarters for the whole complex as well as rows of prisoner housing, SS barracks, and a crematorium. We walked through the main gate with the sign Arbeit macht frei (work sets you free) overhead, past the double fence of barbed wire with guard towers, and ultimately stopped at Block 3 located in one of many rows of housing. Our tour included Block 3 which was not open to the general public. This was a women’s block where 700 people lived. The first room in the block was for the kapo, a prisoner assigned by the SS Forces to supervise the other prisoners. Several more rooms where three-four people slept per each level of the bunk beds lined the block’s hallways. Furthermore, the block contained a mass wash area of sinks and another for toilets. The inmates were only allowed to use the facilities twice a day. It was always best to have a top bunk in the barracks due to dysentery. Despite the dysentery and unsanitary conditions, having a janitorial job was a blessing. Not only did prisoners have to survive illnesses caused by unsanitary living conditions, they had to live off a portion of rotten veggie soup, a piece of bread, and maybe a slice of sausage to be washed down with black water for the entire day. On top of the meager rations, prisoners were expected to work 12 hours days. As a result, the life expectancy of an inmate in Auschwitz averaged two months. After visiting Block 3, we walked down the row to Blocks 4 and 6. Each row housed approximately 10,000 prisoners. Block 4 and 6 were turned into museums. Several rooms featured a variety of displays. Information boards, models of the crematoria, prisoner files, prosthetics of the disabled deported to Auschwitz, prisoners’ luggage, shoes and spectacles from gassed victims, empty Cyclon B cans (the chemical used to gas the people), as well as 2000kg of hair cut from inmates about to be gassed were just a few of the displays. The hair, which was sold for profit, filled a glass enclosure along a whole wall. Photos prohibited. “Mug shots” of prisoners being processed into Auschwitz hung along the museum’s hallways. As supplies decreased, the Germans only photographed other German prisoners, and none the mass transported Jews. One glass case featured a photo of Witold Pilecki. Pilecki was a former Polish calvary officer and also co-founder of the Secret Polish Army, a resistance group in German-occupied Poland, and a member of the underground. He volunteered for a resistance operation that required he be imprisoned in Auschwitz. Eventually he escaped and reported on the atrocities at Auschwitz. From these museum blocks, we headed over to Blocks 10 and 11. Block 10 was used for human experiments. German doctors deliberately exposed prisoners to toxic substances in order to study the effects. They also injected inmates with diseases for vaccination research. Furthermore, doctors used X-ray technology to experiment with mass sterilization. But the most infamous doctor was Josef Mengele, also known as the angel of death. The doctor worked with twins. He would experiment on one twin until it died and then kill the other one to conduct comparative autopsies. Block 11 was known as the death block. It served several functions including being the camp jail. The jail held prisoners expected to be involved in clandestine activities such as attempting to escape, organizing mutinies, or having contact with the outside world. The jail also imprisoned outside Poles arrested for rendering aid to prisoners. These Poles awaited trial here and were usually sentenced to death by shooting. They had to strip and wait naked until they were escorted outside to the shooting wall. The jail’s basement was comprised of a number of punishment cells. There were standing cells where inmates were required to stand facing the wall for days and dark cells with limited access to light and air. Prisoners accused of disobeying rules at the camp were sent here to die of starvation. Another cell is a memorial to Priest Maksymilian Kolbe who volunteered to die of starvation so another man could live. Photos prohibited. The first attempt at experimental gassing at Auschwitz also took place in the basement of Block 11. At first, the Germans did not use enough gas and the victims suffered for two days before they finally died. Upon fine tuning the gassing, the Nazis built gas chambers and crematoria. The first crematorium, located in Auschwitz I, was used as a munition bunker prior to the war. The Germans converted it and used it as a crematorium from August 1940 to July 1943. In 1941, they changed the largest room that served as a morgue into a gas chamber. The Nazis used the gas chamber for about a year until the establishment of Auschwitz II-Birkenau which initially included two more improvised gas chambers. In 1942, the Germans completed the gassings at Auschwitz II-Birkenau, but they still burned bodies in the crematorium at Auschwitz I. When Auschwitz II-Birkenau was equipped with four gas chambers and crematoria by 1943, the Nazis converted Crematorium I to a storage facility and bomb shelter. Before leaving Auschwitz I, we visited Block 26 which featured gripping home movies of times before the war as well as movies of the Nazi marches. One of the most powerful displays was the “Book of Names” which included every name of those murdered. The enormous book, with names in alphabetical order, took up a whole room! Despite seeing all of this, it is difficult for me to fully comprehend all the horrors. We took a 45 minute break for lunch at the on-site restaurant before we loaded the public bus to Auschwitz II-Birkenau. The construction on Auschwitz II-Birkenau began in October of 1941. The initial plans called for a labor camp of 50,000 prisoners of war. Soon, however, with the decision to annihilate all Jews, the plans expanded the camp to house 200,000 people and the labor camp was changed to an extermination camp. The first people the Germans deported to Auschwitz I between 1940-1941 were Polish prisoners and prisoners of various nationalities of whom half perished. In the summer of 1941, 15,000 Soviet POWs were deported to Auschwitz I and eventually moved to Auschwitz II-Birkenau. Almost all perished. The mass deportation of Jews to Auschwitz II-Birkenau began in March of 1942. The Nazis transported the Jews in train cars made for animals. The trains came directly into the camp on extended tracks. Those who survived the suffocating and unsanitary conditions of the rail cars were immediately subject to a selection process. The SS doctors inspected the Jews upon exiting the train cars. They directed the Jews who were fit to work to one line and Jews who weren’t fit to work to another. Those not fit to work were mainly women, children, cripples, and sick people. The Nazis sent them directly to the gas chamber. Those fit for work were taken to a registration building (aka the Sauna). Here, they undressed, received their tattoos, got their body hair shaved, and entered disinfecting showers. Once showered, they waited naked until they received their striped uniforms. After receiving their uniforms, they marched to their blocks for life in camp. The Jews left all their belongs behind at the train. The Germans took the goods to Kanada, a large room also located at the Sauna. The Kanada Kommando, prisoners who worked in the room, sorted the belongings to return to Germany. The prisoners called the room Kanada (German for Canada), because the they considered Canada a land of wealth. The inmates at Auschwitz II-Birkenau lived in one of two types of barracks, brick or wood. The wood barracks, on one side of the camp, were originally stables for horses. The thin walls with holes made for very cold winters for the 400 prisoners who slept in the three-tiered bunk beds. The only “windows” in the wooden barracks were skylights. The other section of the camp contained brick barracks with small windows. These barracks slept 700 prisoners in 60 spaces. Both types of barracks included stoves for heating, but there wasn’t any fuel. We visited the barracks, wash rooms, and the prisoner selection area before heading toward the gas chambers and crematoria as well as the International Memorial. As mentioned previously, the Nazis constructed additional gas chambers and crematoria. We visited Crematorium II and Crematorium III. These gas chambers and crematoria could murder 2,000 people and burn 1,400 bodies a day, respectively. Two additional crematoria called Crematorium IV and Crematorium V handled between 700-800 victims. All operated at the same time. Near Crematoria II and III stands the International Monument, erected in 1967 to honor the victims of Auschwitz. The monument features a jumble of stones that represent the victims. In front of the monument, 27 plaques in different languages all say the same thing. Each plaque represents a nationality murdered at Auschwitz. There is also a plaque in English, the universal language, so visitors may read the sign. We continued on past sewer plants and pools to the Sauna. Stated above, the Nazis used the Sauna, which began operation at the end of 1943, to register prisoners, for delousing, for sorting belongings in the Kanada room, and sometimes also for gassing. This building, somewhat far from the entrance of Auschwitz II-Birkenau, isn’t included in all tours. Fortunately, we toured this building. We entered in the Kanada room, passed through the shower room and drying room, saw the steam chambers used to clean clothes and finally reached a room that included family stories and pictures of camp prisoners. This room might have been the most moving of them all. After touring this building, we returned to the Auschwitz II-Birkenau entrance as we took in the surroundings. 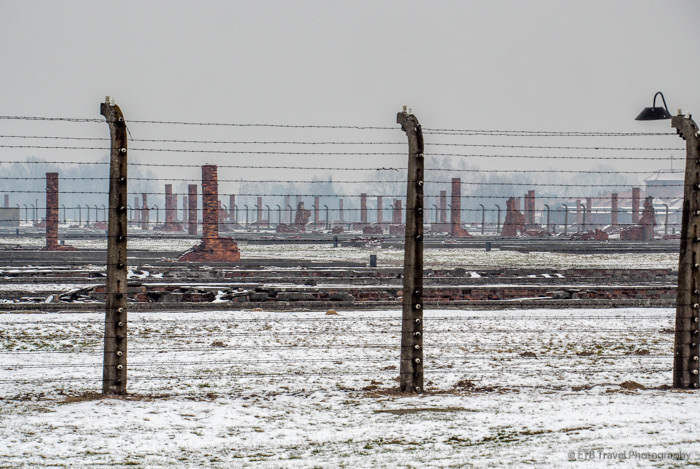 A light snow blanketed the expansive fields of burnt structures with only chimneys remaining. The Nazis destroyed these buildings in an effort to cover up mass murder evidence as the Soviets approached near the end of the war. In addition to burning several buildings, the Nazis took all the prisoners who were deemed capable with them. Ultimately, the walk turned into a “death march.” The Germans either shot or left behind the weaker prisoners as they expected them to die before the Soviets arrived. The Red Army, however, found and freed 7,000 starving victims. Upon reflecting after the six-hour tour, it’s hard to fathom that the prisoners who came to Auschwitz didn’t know they were going to die. They truly thought they were there to work and willingly walked to their death while following the selection process orders or died of starvation or illness later. Neither the prisoners nor the Allies believed the Nazis were committing mass murder despite reports. What a repulsive and tragic set of events! The thought of an entire society being brainwashed to annihilate another society is truly mind boggling to me. Seeing how much these people suffered is a reminder of how good our life is today, contrary to what many people seem to think. I can’t imagine the terror and misery these victims, survivors, as well as all the service men and women in World War II faced and felt. Wow! I think I was so bad at history in school that I learned a bunch. That might have been what held my attention. But you are right, no matter the time spent there, it is an important lesson for everyone. Thanks for commenting. This was a very informative post. So, so sad. Truly hard to believe this could have ever happened.